"I Built My House Upon A Stone" - WorshipFuel by CCLI® - Worship, Music, Copyright ... add fuel to your worship! Home Equip Contemporary "I Built My House Upon A Stone"
Ask Jason Upton which song from his impressive body of work never seems to fail to have an impact, and he is quick to cite “I Built My House Upon A Stone”. My story’s crazy but it’s true… It started out confusing too and just gets stranger by the day. “I Built My House Upon A Stone” may have sprung from a question asked many centuries ago. But in crafting an answer through song it became a testimony for thousands. This song was released on Jason Upton’s albums Glimpse and Sunday Morning, Live in Winston Salem. Jason was speaking with Leon van Steensel of CCLI’s office in The Netherlands. 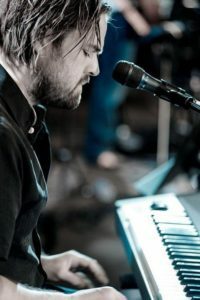 Song lyrics, lead sheets and chord sheets for many songs by Jason Upton are available in SongSelect by CCLI. Owner of Leon van Steensel Productions in The Netherlands.